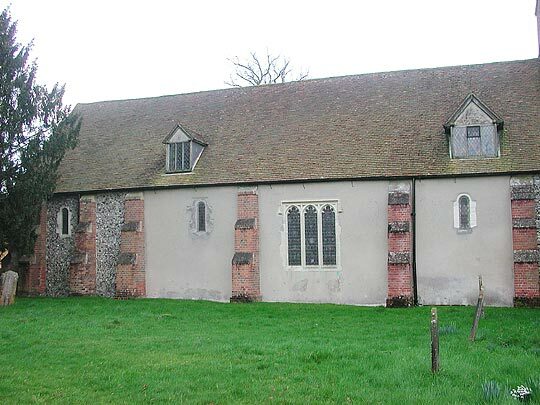 Externally the church has as its interesting features one complete, one renewed, and one fragmentary Norman window (all on north side). 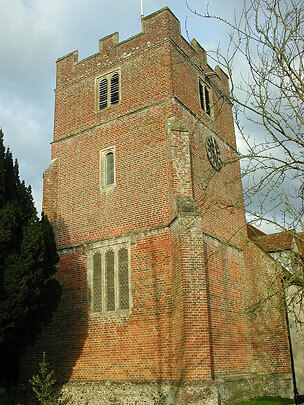 ... Squat W tower of brick, dateable to 1636, with a (re-set?) 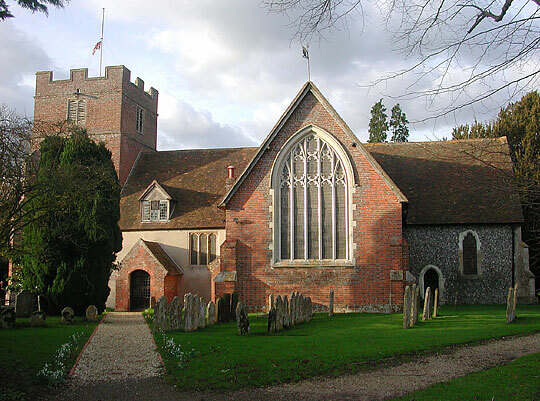 W window and bell openings like the Elizabethan nave window (between) the late C18 S porch and the S transept (Brocas Chapel) which is by Soane and was built in 1801. 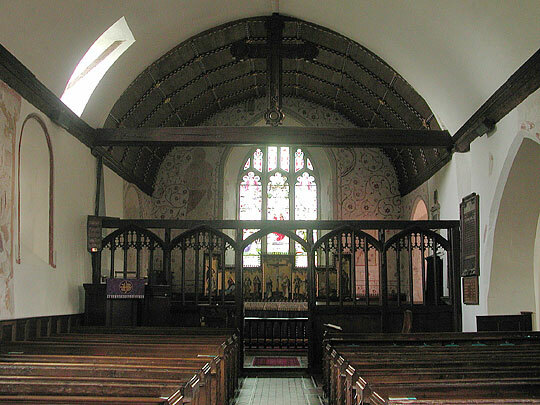 Nave and chancel with Perpendicular east window. 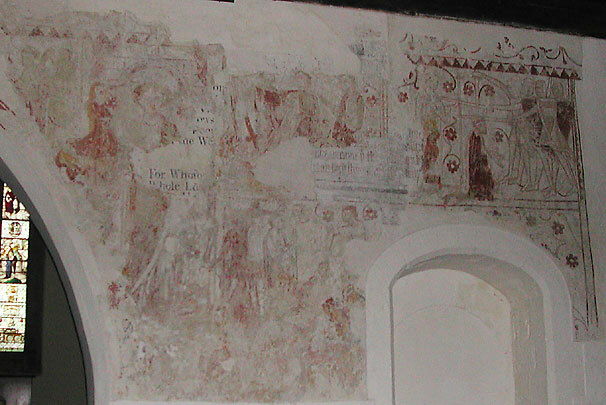 Paintings in the chancel: C13 masonry pattern with addorsed flowers on stalks. 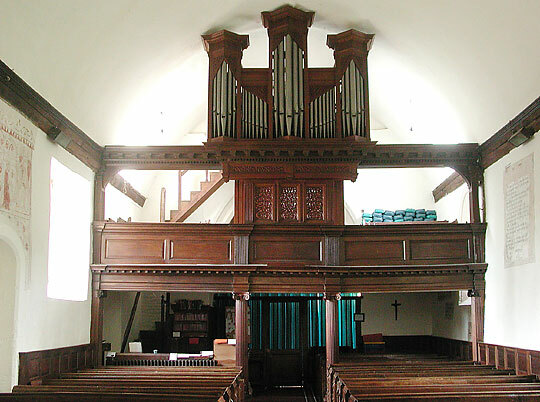 Also, N of the altar, large over-restored St James ... 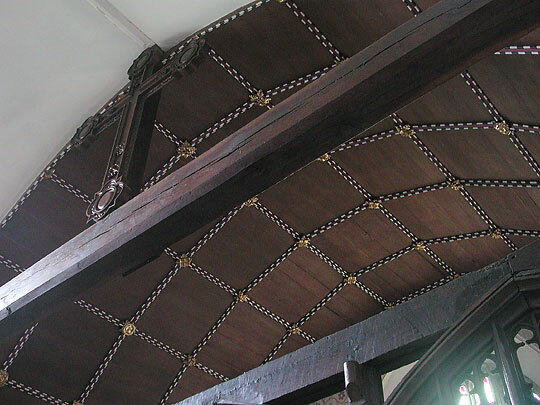 There is no division at all between nave and chancel - except for the ceilure or rood canopy ... This is ceiled and has bosses in the junctions between the square panels. It was made in 1539-41. West gallery. Early C18. On fluted Ionic columns. Painting. In the nave Murder of Becket, C13. Over restored. To its r. another scene. More scenes were below. - Opposite the nave S door St Christopher, huge, C15. Continuous rolls on the Norman windows. 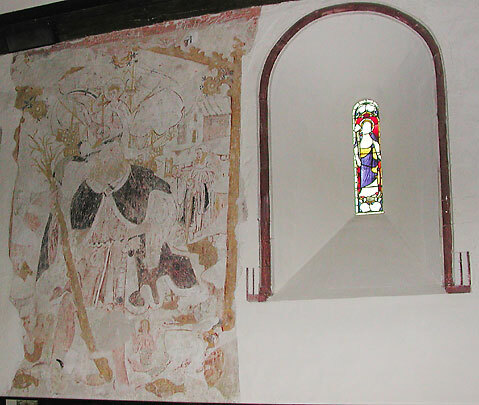 South transept (Brocas Chapel). It has a depressed pointed tunnel-vault of plaster with thin transverse ribs and diagonal ribs and additional ribs of tierceron resemblance, but archaeologically completely misunderstood.